Late last year, congressional Republicans passed a $1.5 trillion tax cut, which delivered the lion’s share of its benefits to the wealthy and corporations. The GOP did not justify this policy on the grounds that all corporate shareholders and trust-fund hipsters deserved to have their wealth increased. Rather, the party argued that, however one felt about making the rich richer, the tax cuts would ultimately benefit all Americans by increasing economic growth and lowering unemployment. But what if we could have achieved those objectives, at roughly the same price, by forgoing tax cuts — and wiping out every penny of student debt in the United States, instead? A new research paper from the Levy Economics Institute of Bard College suggests this was, in fact, an option. 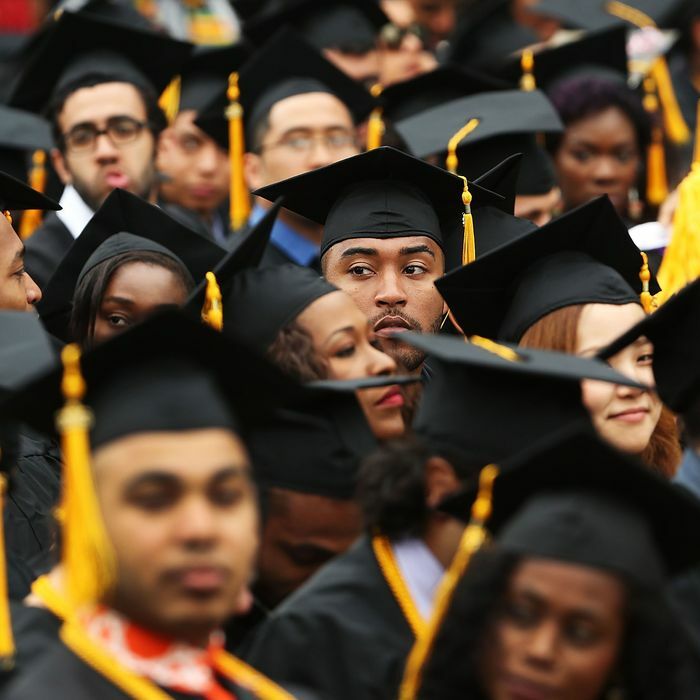 In America today, 44 million people collectively carry $1.4 trillion in student debt. That giant pile of financial obligations isn’t just a burden on individual borrowers, but on the nation’s entire economy. The astronomical rise in the cost of college tuition — combined with the stagnation of entry-level wages for college graduates — has depressed the purchasing power of a broad, and growing, part of the labor force. Many of these workers are struggling to keep their heads above water; 11 percent of aggregate student loan debt is now more than 90 days past due, or delinquent. Others are unable to invest in a home, vehicle, or start a family (and engage in all the myriad acts of consumption that go with that). 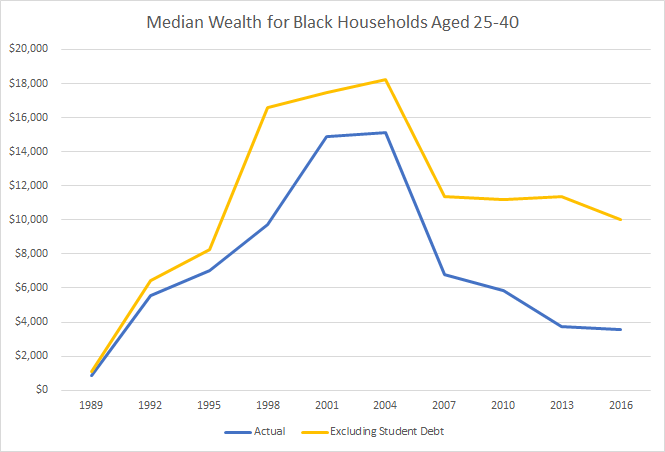 Thus, if the government were to forgive all the student debt it owns (which makes up more than 90 percent of all outstanding student debt), and bought out all private holders of such debt, a surge in consumer demand — and thus, employment and economic growth — would ensue. According to the Levy Institute paper, authored by economists Scott Fullwiler, Stephanie Kelton, Catherine Ruetschlin, and Marshall Steinbaum, canceling all student debt would increase GDP by between $86 billion and $108 billion per year, over the next decade. This would add between 1.2 and 1.5 million jobs to the economy, and reduce the unemployment rate by between 0.22 and 0.36 percent. 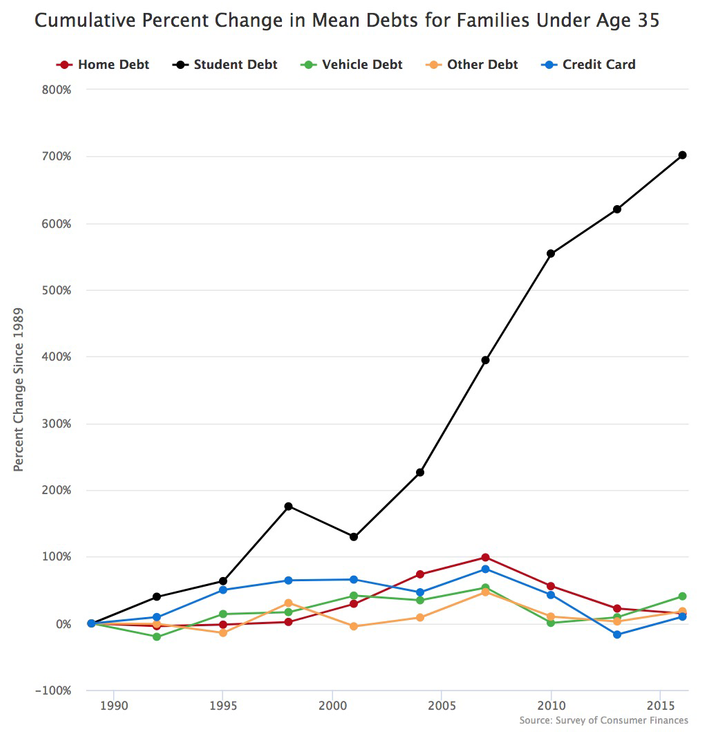 So, the macroeconomic upside of canceling all student debt would be substantial. The primary (supposed) downsides of such a policy would be a higher deficit, the potentially regressive distributional consequences of debt forgiveness, and (relatedly) the unfairness of rewarding certain well-off borrowers who don’t “deserve” it. Of course, all of these critiques would apply more powerfully to the recently passed tax cut bill. Few people would argue that increasing Harvey Weinstein’s after-tax income was a laudable public policy goal. But no one thinks that we should judge the merits of a tax cut on the basis of whether it rewards any unsavory individuals. And in the case of student debt forgiveness, concerns about unfairness are largely informed by status quo bias. It’s true that increasing the net worth of some upper-middle-class Harvard graduates by $200,000 — while giving nothing to working-class City College graduates who already paid off their student loans — is not, in and of itself, a progressive proposition. But viewed in its totality, the post-debt cancellation world is considerably more egalitarian than the one we live in now. 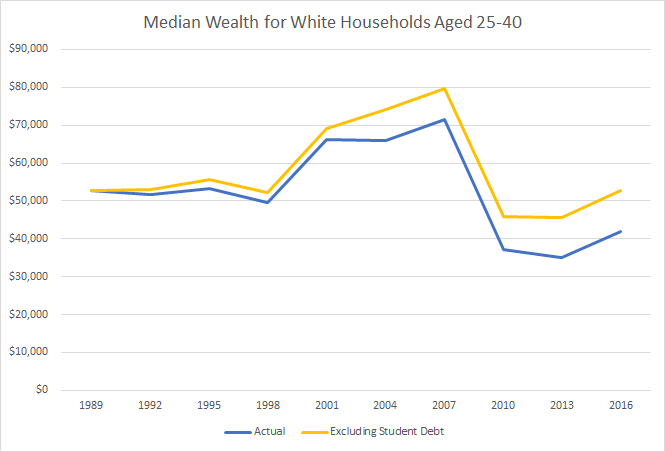 One implication of this, as the policy analyst Matt Bruenig has demonstrated, is that student debt is significantly increasing the racial wealth gap among younger Americans. The reason for [the] vast enlargement of the population of [student loan] borrowers is the worsening labor market. Scarce jobs are allocated to the most credentialed applicants, which triggers a rat race of credentialization, and that rat race is worst for minorities. That young cohorts are better educated than their predecessors should result in higher lifetime earnings, if the “skills gap” mythology that motivated the expansion of the federal student loan programs were true. Instead, more and more expensive credentials result in jobs that pay the same or worse, leading to the escalation of debt loads. Student debtors were, in many, many cases, persuaded to make poor financial decisions by their own government — which, as the owner of their debts, now stands to profit from those mistakes. By wiping the slate clean, Uncle Sam wouldn’t just improve the macroeconomy, but also increase its fairness, and reduce racial inequality. And once that’s done, the government can turn its attention toward ensuring that no future college students are burdened by such massive debt loads ever again. To make public education work as a vehicle for socioeconomic mobility — in a world of ever-rising tuition rates and stagnant wages for college graduates — we’re going to need a new model for financing higher education. A simple and remarkably affordable option would be to make public universities free. Doing all this would probably require a few significant tax increases. Fortunately, there are now a great many pass-through business owners and corporate shareholders who could sorely use one of those.